Think you might know what lurks behind the meter cover? Chances are you will think twice after reading this article! 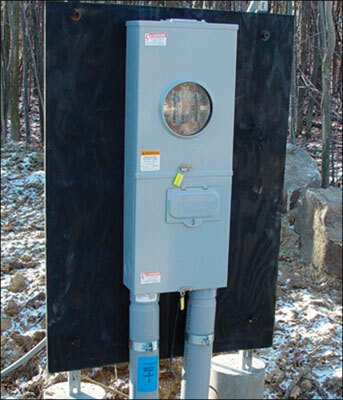 Meter enclosures are part of every electrical system. But how often do you look inside the enclosure after it has been installed and energized? A utility provider provides electricity to a customer in order to make a profit. Typically, this is accomplished by metering the electrical system at the point of connection. Electronic receiver/transmitter (ERT) meters are becoming more of the norm in today’s electrical metering systems. They provide many benefits to the electric utility provider and to the customer. But, this could allow for many unforeseen problems as well. Photo 1. A 400-ampere, single-phase meter enclosure located at the front entrance of a church and preschool. Men, women, and children visiting this location walk by this meter enclosure on a daily basis. What’s located behind the cover could prove deadly! And chances are it will not be discovered until there is a problem. For many years the measurement of electricity went relatively unchanged. These metering devices worked adequately for the utility provider to accomplish the goal of registering electrical usage so that a utility bill could be generated. The customer received the monthly statement and would pay his or her bill. In the event the customer fell in arrears and did not pay the monthly bills, a customer service representative would visit the location and disconnect the power. To accomplish this, the meter seal would be cut, the electric meter removed and booted off, and then reinserted into the meter base. The cover is then reinstalled and re-sealed until a time in which the customer pays the outstanding bill and any reconnection charges. In the event of tampering, the meter would either be removed and a blank inserted or the service conductors cut and disconnected at the weatherhead or utility pole. Photo 2. Within the meter enclosure unknown to daily passersby are several potential dangers as can be seen, such as corrosion, effects of overheating to busbars and conductors, insulation failure as well as conductor damage. When the service is ready to be reconnected, the customer service representative then returns to the property, cuts the meter seal, removes the meter, removes the boots and reinserts the meter. The cover is then installed and another seal applied. This returns electricity to the customer and usage is recorded for the next monthly billing cycle. During this entire process there were several opportunities for the utility representative to notice and report any problems developing within the meter enclosure. Upon discovery, action could be taken to alleviate potential problems before they happened. Technology has changed the way that utilities gather billing information and even the disconnection of delinquent accounts. This has in turn made it even more imperative that electrical work within the meter enclosure be installed in a code-compliant fashion. A statement must be mentioned concerning safety regarding this issue. Unbelievably, some customers take it upon themselves to reconnect their electricity without the approval of the serving utility. This has resulted in additional fees being accessed by utility and the electrical meter being removed or the conductors disconnected at the weatherhead or utility pole. This illegal activity can result in electrical accidents up to and including death. Qualified personnel are necessary to reconnect these services to assure the safety of the electrical system. Never attempt to reconnect your electrical service! Contact your friendly utility provider for help with this situation. Photo 3. 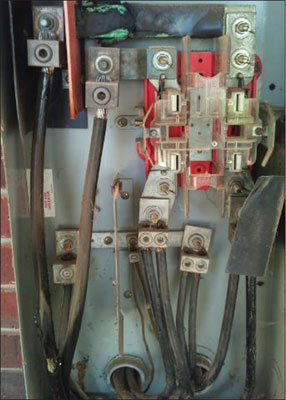 The interior of this meter enclosure depicts damage due to overheating and corrosion. Remember, none of this damage is visible from the outside of the meter enclosure. An electronic receiver/transmitter meter (ERT meter) is used in a network meter reading environment. It can be retrofitted into existing meter enclosures and is available in single- phase and three-phase models. 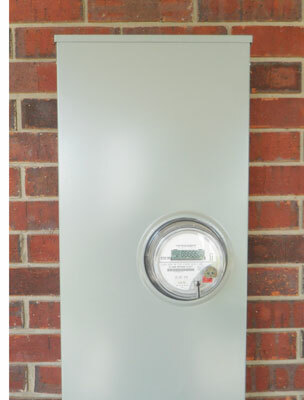 The meter uses electronic modules to communicate power consumption and power quality to the utility provider. The meter also allows two-way communications from the utility provider to the customer. This allows the utility provider the opportunity to be aware of outages that occur and to respond much more quickly. The use of ERT meters saves the utility provider from physically visiting the meter location on a monthly basis. The ERT meters have a low-powered radio device that permits them to be read from a distance. This allows meter readings to be collected electronically with a mobile data collector (usually a laptop computer) or with a handheld receiver. Technicians are able to download the readings for multiple meters at one time rather than walking from house to house to look at each individual meter. In some cases, the utility can also disconnect and reconnect the customer remotely. This can be for nonpayment of their monthly bill or to head off high demand issues on the utility system. This can be handy during high usage periods where the provider needs to disconnect loads within structures to prevent brownouts or blackouts from affecting the system. Many household devices are being produced with communication features that communicate with the electronic meters. Utilities can disconnect AC units briefly to prevent issues on the system from occurring. Most generally the customer is unaware that this has even taken place. Some consumers have expressed concerns regarding this issue as it applies to privacy. Many customers enjoy the features of ERT meters. This technology allows the customer to monitor their electrical usage. This has also allowed the customer to change some of their usage patterns in order to save money on their electrical bills by using electricity in the off-peak periods. As you can see, the use of this technology removes the “hands on, eyes in the field” that may have visited the enclosure and discovered a problem. This can result in minor situations arising that develop into major issues. These issues can be lessened by proper equipment installation and inspection. Photo 4. 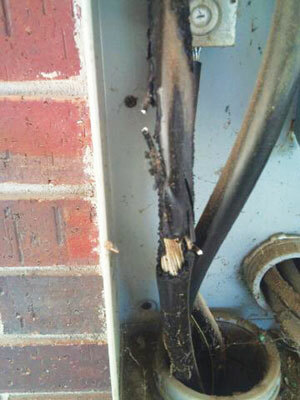 Conductor damage due to insulation failure that is not detectable from the exterior of the meter enclosure. The first line of defense in addressing this issue starts with the electrical contractor. The contractor must make sure that all material used for the installation is listed and labeled as per requirements found in NEC 110.3(B). Proper application of NEC requirements will help ensure a safe and compliant installation. NEC Article 110 covers the requirements for electrical installations. Requirements found within this article include working clearances, interrupting rating, mechanical execution of work, mounting and cooling of equipment, illumination, electrical connections, arc-flash, and field marking. There are other requirements that are useful and required throughout the NEC as well. Care must be taken to follow the manufacturer’s installation instructions. Special care must be taken to use anti-oxidant compounds as required by the NEC and the manufacturer. These requirements are found in NEC 110.14. 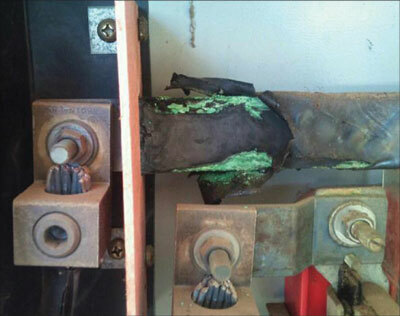 Conductors should be stripped and prepared properly so as to not damage the conductor. Specialized tools are necessary to assure that the specific torque requirements are followed for the lugs and conductors. Informative Annex I includes recommended tightening torque values to be used in the absence of the manufacturer’s recommended torque values. These values are taken from UL Standard 486A-B. The next line of defense lies with the electrical inspector. The inspector needs to assure the customer and utility provider that the electrical contractor has followed the guidelines for properly installing the metering equipment. A good understanding of the NEC and any additional electrical requirements required by the utility provider are necessary. Some of these requirements have been previously discussed. Additionally, the inspector needs to make sure that proper grounding and bonding has been accomplished. Grounding and bonding requirements can be found in NEC Article 250. Also, remember that the insulated fitting required at NEC 300.4(G) is required due to conductor size, not conduit type. Bushings are required for various conduit types throughout the NEC such as at 344.46 for rigid metal conduit. There have been many instances where the electrical installation has been turned down by an inspector due to a missing conduit bushing or insulated fitting. Photo 5. 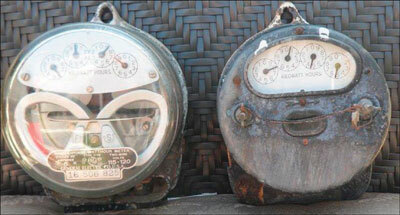 For years a standard 2s meter was adequate for the needs of the utility company. Today’s technological advances have spurred changes within the utility industry in order to compete and reduce operation costs. Electronic radio transmission (ERT) meters may be able to control some electrical devices within the structure through the electrical utility to prevent system problems. These include the refrigerator, the air conditioner or some other high usage item. Privacy issues have been expressed by some people. New to the 2011 NEC are 110.16 and 110.24 which deal with arc-flash and available fault current markings and requirements. Section 110.16 states that the marking shall be located so as to be clearly visible to qualified persons before examination, adjustment, servicing, or maintenance of the equipment. This includes meter socket enclosures as well as switchboards, panelboards, industrial control panels and other motor control centers. These requirements do not apply to dwelling units. Service equipment must be marked with the maximum available fault current per NEC 110.24. This Code requirement further states that the field marking shall be legible and include the date that the fault-current calculation was performed. It must also be sufficiently durable to withstand the environment in which it has been installed. Modifications require that this calculation be verified and recalculated as necessary to ensure the service ratings are sufficient for the maximum available fault current at the line terminals of the equipment. An exception exists for industrial installations where conditions of maintenance and supervision ensure that only qualified persons service the equipment. Again, as previously stated these requirements do not apply to dwelling units. These requirements help to ensure that whoever works on this equipment in the future is aware of the potential available fault current. This also brings up an interesting question. Who is responsible to adjust the modification markings to the existing equipment as per the requirements found within 110.24? Suppose the providing utility changes out the transformer to the building. Suppose the impedance is different from the existing transformer to the newly installed transformer. Who makes the changes to the marking at the service equipment? Is the building owner aware that these changes have been made and what effect it has on the available fault current to his equipment? Does the utility provider even know that this requirement is found within the NEC? How does this information get upgraded on the electrical equipment? Photo 6. This electrical service location has a meter blank installed and the meter retired or taken out of service. This could be due to non-payment for services, tampering or because the electrical equipment is no longer in service. Most utilities work under the guidelines of the National Electrical Safety Code (NESC). During a power outage at 2:00 A.M. in the pouring rain and lightning, who will make these adjustments in the field? Is there communication between the utility provider and the customer concerning these changes? What happens when the utility changes the substation feeder to this area of town from one substation to another? There are different characteristics present in both substations that will affect the calculations towards what is marked on the service equipment. These are just a few questions and situations that could arise and affect the accuracy of the field markings for these installations. Interestingly, during the 2011 NEC Report on Proposals (ROP) and Report on Comments (ROC) meetings these situations were vigorously debated and discussed. The inclusion of the date of when the calculation was conducted was agreed upon and included so that the future electrical contractor would be aware of when the calculation was conducted. Under no circumstances should the electrical contractor rely on a marking on the equipment to determine the level of personal protective equipment (PPE) required. Changes to the system may have taken place after the date the calculation was performed, changing the available fault current at the terminals of the equipment. In conclusion, a properly installed and inspected electrical service should provide years of service to the customer. If the customer increases the electrical load by adding new electrical appliances, the service size may need to be re-evaluated. There are many existing older homes and commercial locations with electrical services that were acceptable at the time they were built. Over the years with the addition of new electrical appliances, these services may no longer be adequate for their situation. An electrical contractor should review these services and determine if modifications are needed. Believe it or not, there are still several locations within utility territories that have only 120-volt services. Usually these are only 60-amp services. This service was all that was necessary to provide electricity to the few devices available at that time. Technology has brought us many new items to add comfort and convenience to our daily life. Many homeowners are shocked when they purchase a new air conditioner or electric dryer to find out that they will need to modify their electrical service to utilize the equipment. Many tend to be elderly and on a fixed income. Field markings are crucial to the safety of the equipment, the electrician and the electrical inspector. All attempts should be made by the utility and the customer to maintain the accuracy of these markings. Doing so may mean the difference between life and death! And remember to consult the utility provider and to secure the required permits from the authority having jurisdiction (AHJ) before beginning the electrical upgrade. The utility provider may need to re-evaluate transformer sizes and make adjustments to their system due to your planned modification. What worked for the utility years ago may need modification today. Are we ready for electric vehicles?